The context about new growth countries – emerging markets – has changed over the last year. What was sometimes too much of a hype has now given ground to gloomy perspectives. However the potential for sustainable high growth remains unchanged. A brainstorming discussion among the participants will identify the key perspectives and issues shaping their outlook. The outcome of this brainstorming will feed into the agenda of the different sessions in the next two days. Rakesh Mohan, Executive Director, International Monetary Fund (IMF), Washington D.C. The slowdown in many emerging markets – new growth countries – has highlighted the need for differentiation about the existing conditions in the different countries. It has also illustrated the fact that while some reasons from this slowdown are linked to changes in the global economic and financial context, such as the gradual tapering of the Quantitative Easing of the US Federal Reserve, other important causes for this slowdown in some new growth countries are mostly linked to domestic reasons such as the need for additional structural reforms, sounder financial policies and rebalancing macro-economic conditions. A discussion of measures required today to reverse the slowdown and revive growth on a sounder basis. A roundtable discussion to allow the Co-Chairs of the 2nd Annual Meeting to share their thoughts with the participants about the present global economic and geopolitical landscape: What strikes them most at the present moment in terms of the challenges we are facing and the issues that dominate the economic and political agenda? What do they see as the greatest matters of concern or reasons for hope and optimism? 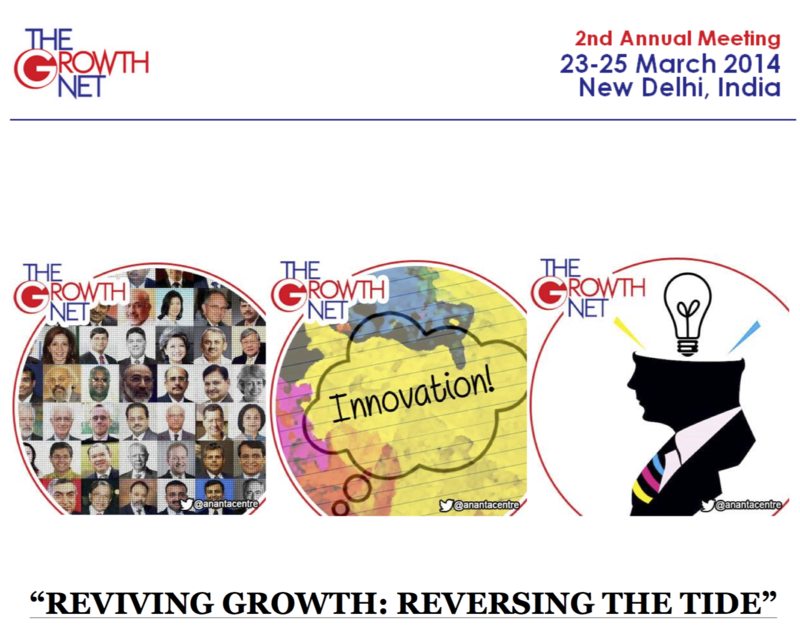 This sharing of insights with the participants will help set the backdrop for the discussions of the 2nd Annual Meeting of The Growth Net. Ronnie Chan, Chairman HangLung Properties, Hong Kong S.A.R. markets as well as on the most developed ones by ripple effect. infrastructure gap, particularly in a time of increased government austerity around the globe. What policy challenges exist in developing and managing these new PPPs? How to ensure the quality of infrastructure development? What business opportunities are emerging and how can they best be leveraged? In most countries, whatever progress is made and whatever the amount of money invested, public education systems are not able to keep up with rising demand and expectations. Private schools and universities are stepping in to fill this gap, providing good education, contributing to creating the much-needed skills and leveraging attractive business opportunities. How can the private and public sectors complement each other to build an optimal educational system? How to ensure that private sector education is not only good business but also good value? How to ensure that the public systems don’t get left behind as rising middle class parents rush to put their children in private schools as soon as they can afford to do it? How to address these changes and the new challenges they create? What does this require when shaping policies and responses relevant to the new security environment? Economic and political developments in a number of new growth countries have highlighted the need for an even more holistic approach to managing risks involved in operating in countries where social and political conditions may be subject to abrupt changes, legal and regulatory frameworks are wanting and poor infrastructure adds to operational risks. New compliance pressures created by the aggressive enforcement of the Foreign Corrupt Practices Act in the USA or the Anti Bribery Act in the UK are forcing corporations to assess even more deeply how business practices in one country could create new risks and impact negatively on their business worldwide. What are the cardinal rules that should guide risk assessment and risk management in this new, more demanding, environment? Stumbling blocks that could be removed? Meeting the increasing global demand for food in a sustainable manner is becoming a major challenge. While the world’s population keeps growing and standards of living are rising, arable land is diminishing because of fast urbanization and industrial use. Investment in agricultural productivity is not increasing fast enough and climate change is already negatively affecting the ability to produce food in some countries. While it is crucial to keep both farmers in business and prices for consumers at a reasonable level, the food scare of 2008 has pushed food security to the top of many countries’ agenda. What measures can be taken to ensure increased agricultural sustainability while at the same time ensuring price stability and food security? How can the agribusiness sector respond to a continuously evolving demand for cutting edge agricultural and food products? How could the global agricultural trading system provide a more dependable market for food? South East Asia was one of the world’s fastest growing regions in 2013 and, despite some risks and uncertainties, growth should remain strong in 2014. Moreover, the next structural step to the process of economic integration through the scheduled implementation of the ASEAN Economic Community by 2015 – with the goal of freeing the movement of goods, services, capital and skilled labor – should boost economic growth and improve the region’s overall attractiveness to investors and its competitiveness. How is increasing economic integration making the ASEAN countries less vulnerable to external shocks? How can other countries latch onto the dynamics created by ASEAN integration? What can be learnt from the ASEAN process of integration? While foreign investment flows have decreased significantly in emerging market countries, opportunities are still there to be seized, requiring a more rigorous differentiated sector and country-wise approach. The present context should also push investors to look for more alternatives to direct investment. Where are the opportunities to be leveraged today? What kind of approach does the new economic landscape require? What are the trade-offs between looking at the short term and betting on the long term? Will China’s single digit growth strategy work? China’s first onshore default has ignited concerns of more episodes of that kind being in the offing as the number of Chinese companies whose debt is double their equity has swelled in the last few years. When also considering the worries about the huge size of shadow banking (estimated at US$ 7.5 trillion) and the slowdown in overall economic activity, one can understand the concerns among investors and policy makers in China and beyond. How to assess China’s present economic situation? Will the leadership in Beijing be able to conduct the shift towards a different economic model while ensuring that growth will remain at a high enough (7 to 8%) sustainable level? Increasing water scarcity means agricultural doomsday in many emerging countries and is not only threatening the sustainability of growth but will be feeding internal turmoil and international tensions. How to manage water resources better? What kind of international cooperative measures are urgently needed? More and more companies from new growth countries have realized – and keep realizing – that at some stage of their development they are compelled to expand their activities and their footprint at the international level. It is not only a matter of tapping new sources of growth but also acquiring new technologies and new skills that will also enhance their competitiveness in their own domestic market. These new MNCs, and MNCs in the making, are reshaping the global competition landscape and creating new business models. However, as much as it opens new opportunities, an international expansion strategy involves in most instances new challenges that will test the leadership and the management capabilities of many aspiring MNCs. A number of African countries have now firmly put themselves on the global growth map. According to the IMF, Sub-Saharan Africa’s growth was about 5% in 2013 and is expected to reach 5.7% in 2014, with even 8 and 8.7% respectively for Ghana and countries like Angola, Cote d’Ivoire, and Tanzania not far behind. Exports, investment and rising consumer demand from the fast growing middle class are driving factors in these higher growth rates. However, weak institutions and regulatory frameworks, political issues, corruption and lagging infrastructure continue to harm growth prospects. How should we assess the risks and opportunities in the region? What should investors look at and think about? What will it take to ensure the long-term sustainability of growth? There is no discussion that India’s economic performance in the last three years has been below par. While some external factors may have played a role in that, the key reasons for this underperformance have been too little too late in terms of appropriate structural reforms, conflicting signals from the government and a still problematic legal and regulatory framework creating uncertainties for domestic and foreign investors. One might say that this has, in fact, deprived India, and India’s population of their legitimate right to a growth commensurate to the potential and resources of the country. What will be required now to restore this “right to growth” to its full extent? How can business use the Bali Trade Agreement as a lever for growth? The Bali Trade Agreement, although not achieving as much as hoped, did make critical progress on key issues related to trade facilitation. In fact, by some estimates, the Bali agreement on trade facilitation measures could boost global output by over $400 billion per year, with much of the benefit flowing to poorer and new growth countries. Many challenges remain in terms of implementing streamlined customs procedures and reducing red tape, but business may be the real winner of this agreement if they can use the outcomes to leverage improved trade opportunities. What are the greatest benefits to be derived from the Bali agreement? What steps should business be taking to maximize the opportunities presented through the measures agreed in Bali? What challenges still remain? policies that will serve the purpose of economic and social development. While the present slowdown has induced many investors and economists into a pessimistic approach towards new growth countries, the key fundamentals for sustainable high growth in most countries have remained unchanged. Learning from the lessons of the present slowdown, what will it take for these new growth countries to fully leverage the potential held by key positive fundamentals?